This summer, California Interfaith Power & Light advocacy made a difference in Sacramento, amplifying the moral call for climate action. Together, we inspired passage of far reaching bills designed to significantly cut carbon pollution and protect the health of our communities. Thirty clergy and faith leaders attended 70 legislative meetings in June and August as part of our Sacramento advocacy days. CIPL sent 10,394 messages on priority legislation and we provided educational workshops and presentations in multiple houses of worship. Thank you for responding, for showing up, making calls, sending messages and speaking out. Thanks to you, California remains a state of visionary leadership, committed to tackling climate change, improving public health and growing the economy. Through interfaith collaboration and working in concert with labor, equity, health and environmental sectors, strong policy became law. SB 32 will reduce greenhouse gas pollution by 40% below 1990 levels, and SB 1383 will significantly reduce the emission levels of highly potent short-lived climate pollutants like methane, hydrofluorocarbons and black carbon. In addition, AB 1550 and AB 2722 will not only increase investments in communities most burdened by pollution and poverty but is the first time that disadvantaged communities are statutorily recognized as recipients of Climate Investment funds. 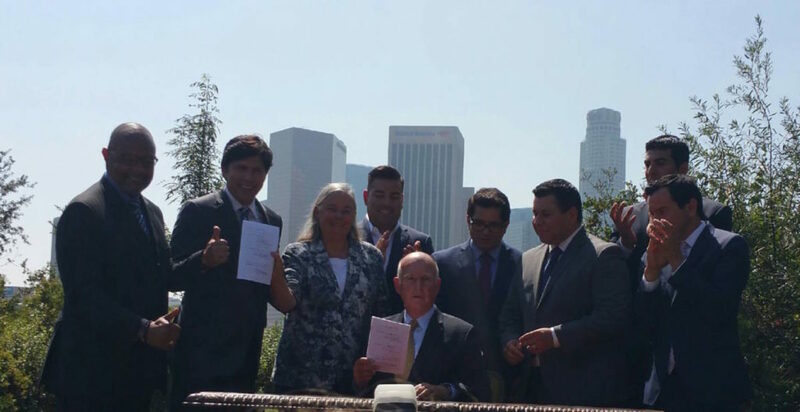 At the signing of SB 32 and AB 197 into law on September 8 in Los Angeles, legislators and advocates from multiple sectors of society gathered to celebrate. Mahatma Gandhi’s famous saying, “You must be the change you wish to see in the world” is truly expressed and being implemented in the hearts and actions of those who gathered and by the members of our diverse statewide network. Climate visionary leadership happens in California because faithful folks, like those in our network, demand it. The policy victories this year serve as a reminder that we truly have the power to usher in a brighter future. Click here to see pictures from our 2016 advocacy and the SB 32/AB 197 signing ceremony in Los Angeles. The busiest time of the California legislature is usually the last two weeks of the session, when bills with far-reaching impacts are subject to intense discussion, negotiation and, sometimes, amendments. August 16 was hopefully an auspicious time for two dozen clergy and faith leaders to make the faith voice heard at CIPL’s Sacramento Advocacy Day, our second visit to the State Capitol this year. The group made 40 visits to Assembly and Senate offices regarding CIPL’s 2016 priority legislation. All five bills have the common theme of greenhouse gas reduction and environmental justice, including: SB 32, which will have California at 40% below 1990 pollution emission levels by 2030; SB 1279, that will prohibit state funds from funding any newly proposed bulk coal export terminals; SB 1383, which will reduce the emission levels of short-lived climate pollutants, including methane, black carbon, and hydro fluorocarbons; AB 1550, that will expand Climate Investment funds to go directly to communities most hard hit by pollution and other criteria; and AB 2722, which will create the Transformative Climate Community Program to direct $205 million of Climate Investment funds to communities most disadvantaged by pollution. Click here to send a message to your legislator. 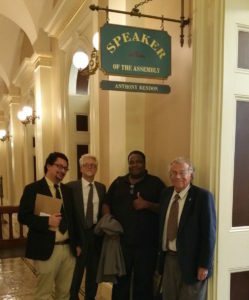 (from right) Rick Bettis, Clando Brownlee, Brickton Kristy, and David Chiu end the day at Assembly Speaker Rendon’s office. Recognizing the importance and positive impact of these bills, as well as understanding the unique voice of the faith community, advocates were armed with personal testimony, talking points, and a keen intention on listening to legislative offices. Latest updates on legislation, especially SB 32 and AB 1550, were shared. At the conclusion of the meetings, a celebratory event honoring Senators Fran Pavley and Ricardo Lara took place at Cafeteria 15L, a favorite Sacramento hangout. Some 60 folks gathered as Senator Pavley was thanked for her dozen years in the state legislature, marked by the passage of California’s landmark climate legislation, AB 32. Bonnie Holmes-Gen of the American Lung Association, James Marston of Environmental Defense Fund, as well as The Rev. Sally Bingham gave remarks on Senator Pavley’s crucial climate leadership, which has impacted the country and the world. The awards themselves were created and donated by California artist and CIPL supporter Jennifer Koney, who attends CIPL member congregation Star King Unitarian Universalist Church in Hayward. The work of the faith community for this legislative session is far from over. Alerts and action are being planned to continue to obtain the votes needed for the passage of these important bills. Make your voice heard by taking action on current legislation. Senator Pavley is celebrated for her dozen years of visionary climate leadership. Additional photos from CIPL’s Sacramento Advocacy Day and Climate Visionary Leadership Awards Reception can be found on our Facebook page. Just days after all California Assembly and Senate bills passed their house of origin, CIPL was out in force advocating for key bills focused on environmental justice, funding equity, and clear pollution emissions targets to avert the worst effects of climate change. On June 8, CIPL staff, steering committee members, interns and volunteers attended 32 meetings with legislative offices – 21 Assembly and 11 Senate – encouraging support for the following bills: SB 32, which will have California at 40% below 1990 pollution emission levels by 2030; SB 1279, that will prohibit the California Transportation Commission from funding any newly proposed projects that allows or facilitates the handling, storage or transportation of coal at a port facility located in or near a disadvantaged community; SB 1383, which will reduce the emission levels of short-lived climate pollutants, including methane, black carbon, and hydrofluorocarbons; AB 1550, that will expand SB 535 to require 25% of Greenhouse Gas Reduction Fund (GGRF) investments to be located within disadvantaged communities, and an additional 20% of GGRF investments to benefit low-income households and communities across the state; and AB 2722, which will create and fund Transformative Climate Community plans in disadvantaged communities most burdened by high levels of pollution. Some offices, especially those concerned with their constituents’ health that is threatened by pollution, were familiar with the bills. Some stated that CIPL’s visits were the first they had heard of these bills, demonstrating the importance of legislators hearing from their districts. The visits highlighted the value of increased relationship building with key legislators, especially those who are deeply involved with the faith communities in their districts. Of the 11 advocates, three interns attended: Kia Jones, Rebecca Bland, and Raphael Flores. In addition, three clergy, CIPL Steering Committee members Rabbi Marvin Goodman, Rev. Chris Breedlove, and Program Director Rev. Will Scott participated. 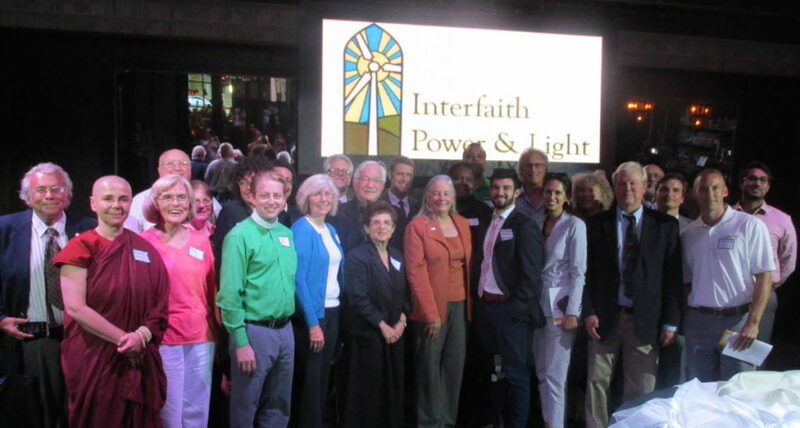 A larger interfaith climate advocacy day is being planned for August 16th CIPL volunteers from key legislative districts are encouraged to attend. Please contact Allis Druffel to find out more. A highlight of the day, in addition to the meetings themselves, was the camaraderie and information sharing that took place on the Amtrak trip to and back from Sacramento. It was certainly a more pleasant and lower-emissions way to travel.